An MSP has cast doubt on claims that the opening of a newly dualled section of the north’s busiest road is being held up by a “technical issue”. The Press and Journal reported yesterday that completion of the £35million Kincraig to Dalraddy section of the A9 dualling programme had been delayed after a problem was noticed with a short section during the final checks. The issue with the 4.7-mile section emerged despite Economy Secretary Keith Brown announcing more than three weeks ago that the new route would be open in the “coming days”. But Highlands and Islands MSP Edward Mountain said last night that he doubted that the technical issue was the only reason behind the delay. The Scottish Conservative representative said: “When I drove down the road yesterday it appeared to me that there was landscaping to do, barriers to put up, road markings to be made and fencing to put in. However, a Transport Scotland spokesman said yesterday that a lot of work could be completed after the road was open. He said: “Our contractor has changed the timing of their finishing works to take advantage of parts of the road being coned off. “All remaining traffic restrictions will be lifted as soon as the technical issue is resolved. 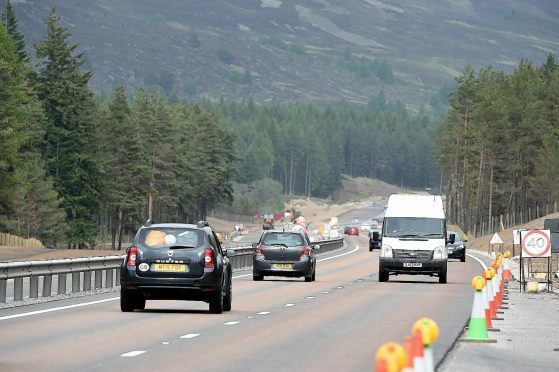 The Kincraig to Dalraddy section is the first of 11 to be constructed as part of the Scottish Government’s £3billion A9 dualling programme between Perth and Inverness. Next week, ground investigations will start on the section of the route between Crubenmore and Kincraig. This work, which is due to get under way on Tuesday, follows the start of similar studies recently on the long stretch between Pitlochry and Glen Garry. It is expected to last around 10 weeks and some traffic management measures will be required, including alternate single file traffic sections controlled by temporary traffic signals.